This is another tasty recipe from Holly Clegg's Too Hot in the Kitchen: Secrets to Sizzle at Any Age, 200 Simple and Sassy Recipes. I love so many recipes in this cookbook because they are so quick and easy to make after a long day at work. There are many skillet recipes to choose from which is my preferred method of cooking on weeknights. I've tried several recipes from this cookbook including Blackberry Chicken and Quick Chicken and Artichokes and they've all been delicious. And, whenever I take a break from this low-carb diet, I'm going to try some of the low-fat desserts, too. They look delicious! Season chicken and coat lightly with flour. In a large nonstick skillet coated with nonstick cooking spray, brown chicken on both sides, remove from skillet. Add onion and green pepper, scraping sides and sauteing until tender. Return chicken to skillet. In small bowl, combine soup mix, 1-1/4 cups water and wine. Pour over chicken. Bring to a boil, reduce heat, and cook, covered, until chicken is tender, 20-25 minutes. In a small bowl, mix cornstarch and remaining 2 tablespoons water, add to sauce in pan. Bring to a boil and boil for one minute, stirring until thickened. Serve chicken and sauce. Kim's Notes: As you can see from the photo, I cubed my chicken breasts to make it cook more quickly. Since the onion soup mix is quite salty, I suggest keeping the additional salt addition down to a minimum. Also, I decided to cook my chicken uncovered. The sauce thickened up quite nicely on its own and did not require the cornstarch mixture. 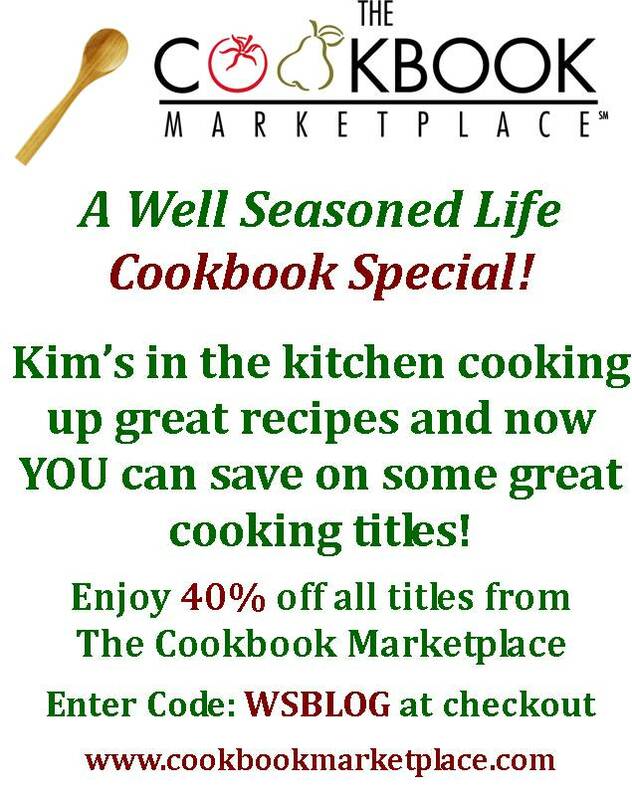 I was provided with a copy of this cookbook through The Cookbook Marketplace. 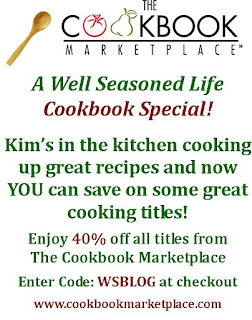 If you would like to purchase this cookbook or another other cookbooks on the site and receive a 40% discount, visit www.cookbookmarketplace.com and enter code WSBLOG.